The Merlin smartphone app has the solution to your bird watching mysteries. Now, Merlin Bird Photo ID takes it one step farther, identifying birds from uploaded photos. Crowd sourcing and artificial intelligence come together to answer a frequently asked question: What bird is that? Merlin Bird Photo ID lets you join in the science fun and identify birds from uploaded photos. Taps into 70 million North American bird sightings and annotations available in the eBird database. You know how it is: You’re on a late-morning hike and a bird pops out of the bush next to the trailside. You’ve never seen anything quite like it — but, unfortunately, there’s no ornithologist at hand. So how can you figure out what it is? If you’ve got your smartphone, then try out the Merlin Bird ID app. 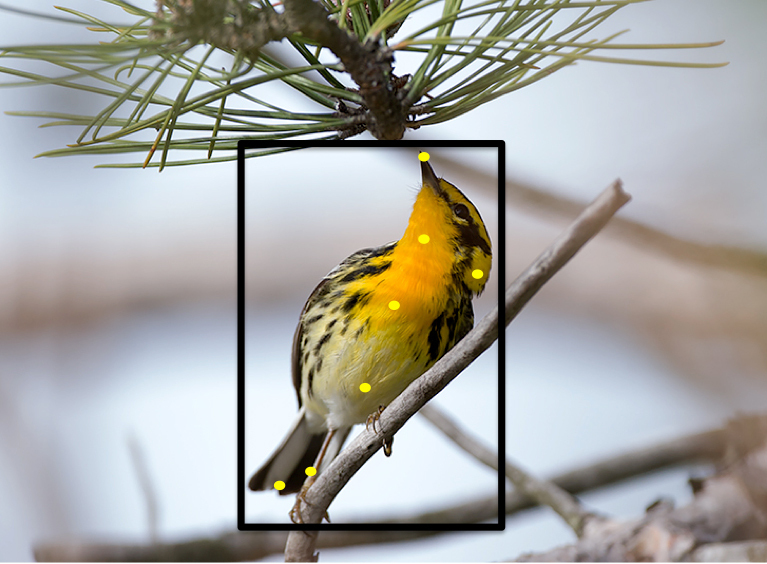 Users helped train Merlin to recognize 400 bird species, including the Blackburnian Warbler shown here, by clicking on parts of the birds to provide information to the computer. Courtesy Christopher L. Wood. Merlin, funded in part by the US National Science Foundation (NSF), comes in two versions. The smartphone app prompts you to enter characteristics and location information, and within seconds returns an identification, replete with pictures and audio samples. The web app takes it a step farther, letting you upload a picture to the Merlin website to aid in your quest to solve the avian mystery. Merlin learned these identification skills by accessing about 70 million North American bird sightings and annotations available in the eBird database. With 250 million total observations, and 1.6 million more coming in each month, eBird is the largest data set on any natural living organism in the world. The Merlin photo ID app, now available in beta version, is based on careful observation. Cornell ornithologists enlisted about 1,000 photographers to contribute 100,000 annotated images (photos where at least two different people have framed the bird and referenced 14 different parts of the bird). Hosted in the Amazon web services cloud, these photos constitute the underlying data set used to train Merlin to recognize 400 bird species. Merlin recognizes these images through fine-grained computer vision and convolutional network algorithms. While Merlin can’t yet identify all photos taken from smartphones, as more annotated images are sent in by birders — from professional scientists to regular folks looking at birds in their backyards — the algorithms will improve and teach Merlin to recognize birds in photos of a lesser quality. Cornell researchers have learned a lot already from the Merlin project, and have reported their findings to the research community in journal articles and conference presentations. At the other end of the data exchange, you get the answers you're seeking while walking the trail wondering about the pretty birds. Now, if only Merlin could help you keep squirrels off your bird feeders. A short introduction to Merlin Bird ID. Courtesy Cornell Lab of Ornithology.